Accept anonymous donations from your supporters. With Anonymous Donations, people can support your cause you without having their name publicly displayed. Donors can choose to remain anonymous when they donate. This plugin allows your donors to remain anonymous. 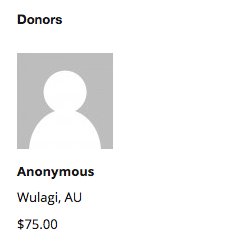 As the website administrator, you are still able to view anonymous donor’s details, but their name and photo will be hidden when displayed in the Donors widget. Anonymous Donations works perfectly alongside Charitable Easy Digital Downloads Connect.